Antonietta Spizzo and Dario Masarotti set off from their home in Italy and made a Long Ride to Poland. A journey, as you can see from the map, which took them from the Adriatic to the Baltic Sea. Italian Long Riders Antonietta Spizzo and Dario Masarotti left home on 1st July, with the goal of travelling across the future European Union, from Italy through Austria, the Czech Republic and Poland to Kaliningrad in the Russian Federation. Antonietta has just sent an email to The Long Riders' Guild, informing us of their safe return. "Everything went very well and we reached the coast of the Baltic Sea in Mikoszewo near Gdansk on 26th August 2003. We left our house in Premariacco on 1st July, and rode for three days in Italy. Then we rode across Austria from 4th to 24th July, via Kärnten, Steiermark and Niederösterreich. On 24th July we crossed into Czech Republic at Drasenhofen/Mikulov. We stayed in the Czech Republic until 6th August, riding across South Moravia (Brno, Olomouc) and East Bohemia. We crossed into Poland at Nachod/Kudowa and rode first towards Wroclaw and then in a straight line toward the North. We found almost always very good, direct roads in the woods, and our route was sometimes even shorter than the normal road for cars. On 19th August we reached Torun, then on 22nd August we got to Grudziadz and from there we rode on the green dam of the river Wisla that is like a big green road and leads to the Baltic Sea at Mikoszewo." "The waves of the Baltic Sea as seen by Terek and Diamantea." "For almost two months the weather was very good - and very, very hot! - but the last two days were really cold and windy, so we couldn't take a bath in the Baltic Sea. In Austria and the Czech Republic we spent almost every night in small Riding Clubs or small studs, while in Poland we nearly always stayed with farmers. We had no problem at all except for the high temperatures, and almost every day we found very good food for the horses, who remained in excellent condition throughout the journey. The people we met were on the whole very friendly and helped us a lot. In the last few days of the journey I was able to speak a little Polish, which is of course important. I had been studying it for some months at home, but it is a very difficult language!" Antonietta, Dario, Terek and Diamantea went home by trailer. The Long Riders' Guild received an email only hours before Antonietta and Dario got into the saddle. "We are planning an itinerary which conceptually unites the Adriatic with the Baltic. We intend to cross the Czech Republic and Poland, both of which will join the EU in a couple of years, and reach the Baltic Sea in the Russian enclave of Kaliningrad (which used to be Königsberg in Eastern Prussia). This small area, sandwiched between Poland and Lithuania, is part of the Russian Federation and, although few know it, will be in a privileged position as the EU grows since it will become a true bridge between Europe and Russia. 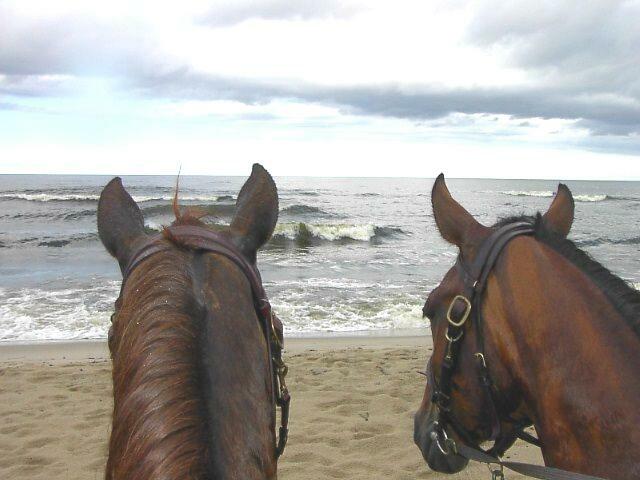 We intend to leave on horseback from Lignano at the end of June. From here we will reach Tarvisio, following "Il Tagliamento" on a route which will become the backbone of the FVG horse trail planned by Fitetrec-Ante. Then we will cross Austria following the historic route used by many travellers from the North to reach Italy. We will head for Vienna first then on to the Czech border. We will cross the Czech Republic travelling North-Easterly through the southern part of Moravia (Brno) and Eastern Bohemia (Olomuc). Once in Poland, our route will pass through Warsaw and the Masuri lake district. The last leg of the journey will be in Russian territory, and will include a visit to the "Trakehner" horse training centre in Maevka, ending our journey in Kaliningrad on the shores of the Baltic." Italian-speakers can read more about this wonderful journey by clicking here.